It's been a few days ago now that I posted my finished log cabin baby blankie with the triangle points on it, and now I wanted to post the kimono I just finished to go with it. I also added a pair of booties just to round out the set and make it a little layette. I think it's a bright fun little baby set for a boy, and a nice alternative to the ordinary blue that we all usually think of in terms of for baby boys. It was fun to use all this color. It sort of reminds me of a box of crayons. I did my kimono a little differently, but we all seem to put our own spins on patterns anyway. That's what m akes k nitting so much fun, right? I finally finished my log cabin - took a little over a year to complete. Details of the blanket are posted on my blog. Stash-busting for charity! 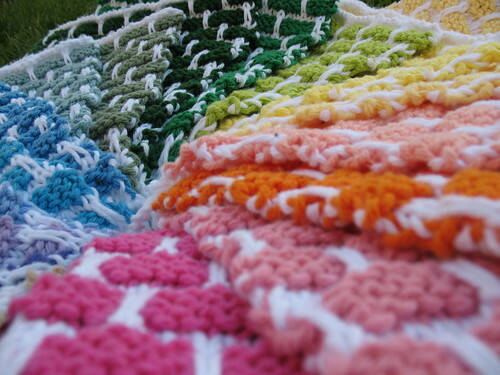 This Moderne Baby Blanket is being made for Afghans for Afghans. My goal is to finish it in time for the Mother's Day shipment to Afghanistan. I'm using Elann's Peruvian Highland Wool and Patons Classic Wool. Here's a tip: if the sheer number of rows you have to knit seems endless, set your row counter so the numbers go down, not up. It's a morale boost. I finished the Nina shawl in just over 3 weeks! I had to work really hard. It was a gift for my son's girl friend. I used Berrocco Touche. It's very soft 1/2 cotton and 1/2 modal. I did have to add about 10 -12 inches to make it come out to 60 inches long! 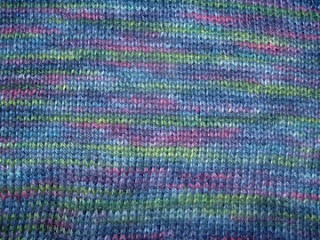 Everything else seemed to be in the correct gauge, although I have to confess I didn't swatch. I think it came out very well. I absolutely LOVE the duck buttons. They are adorable. But the Sugar 'N' Cream variagated yarn? Not so much. 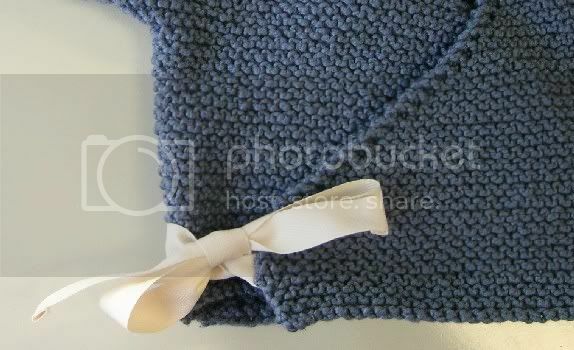 The first bib is made from variagated yarn. I used the left over bit on the second one. My first question is this: If I didn't like it on the first one, why on earth did I add it to the second one? I like the second one otherwise. And look at that duckie? AWWWWW!! You know, I don't even have a kid. So my last question is: Why did I even make either of them? Oh, yeah. As an excuse to use the duck buttons. Right. I started this blanket last summer when I got the book. I joined the kal, and started my own blog and have met some really great friends online. I've gotten a lot of inspiration, and wonderful pattern ideas, and am in awe in general at how wonderful the knitting community is. This particular little log cabin sat untouched for quite some time while I worked on various other projects, until I had a good reason to finish it. A good friend of mine is expecting her fourth baby this summer (a boy). On May 12th they are having a welcoming dinner, and this will be our gift to the new baby. I may make a kimono if I have the time. I did try to put a fleece backing on this blankie, but all my attempts were unsatisfying to me. So I left the back as is. I do have a couple of questions for all of you out there on the kal: Has anyone ever attached a fabric backing to a log cabin blanket, and if so what method did you use? Thanks. I started a Moderne Baby blanket about two weeks ago and it's coming along beautifully. I'm using Lorna's Laces Shepherd Worsted in four solid colors (Violet, Douglas Fir, Cranberry and Blackberry) and Ravenswood hand-painted, which is only going to be the "middle" square and the border. This is going so much faster than the Log Cabin I made last year, the blocks are larger and it just seems to be going more smoothly. I'm still not tired of log cabin knitting. Here's my second blanket, this time with Valley Yarns Valley Superwash in seven lovely colors: colonial blue, forest, grass, ice blue, natural, spring leaf, and my personal favorite, teal. It's baby size. 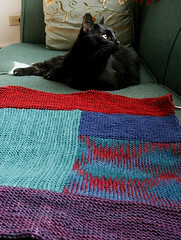 I started more log cabin knitting the same day that I finished the blanket. I think I'm addicted. Here's my Moss Grid Handtowels, just gifted for some friends' anniversary party. They were a great simple and reasonably quick knit. 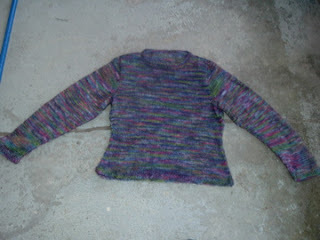 I used Knit Picks Cotlin in Moroccan Red, Nightfall, and Key Lime on size 5 needles. They took just more than 1 and 1/2 balls each so I'll have to come up with something interesting for the scraps. Maybe a matching mini chevron towel. Thanks to Ann setting up the slogalong, I've picked this up again. The yarn is the same as the book, in different colours, in case it doesn't appear true on screen, it is a wheat, a chocolate brown, a light blue and a navy, I have the ball bands if anyone wants the numbers. I'm using size 6 circs and about to change to my knitpicks options for the next strip as it is getting wider. I love the colours together and I really love this yarn, though it is a bit pricey, so look for sales on WEBS or somewhere else. It is warm and really light and very easy to knit with, though I need to have some quality time to get through more than 2 rows (or boring tv with my husband). Hopefully it will be done before next winter!!!!! 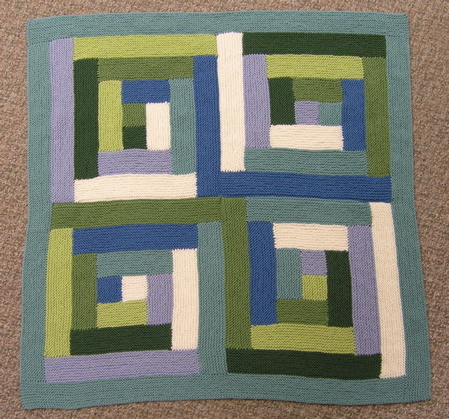 2 more of the log cabin moderne baby blankets i made (crappy photos, sorry). both made from brown sheep cotton fleece (2 skeins of each color), size US 6 needles. i'm working on a third as well. oddly enough, 3 of my knitting group gals are all having babies within 3 months of each other-- so i thought it was fitting to have a theme. 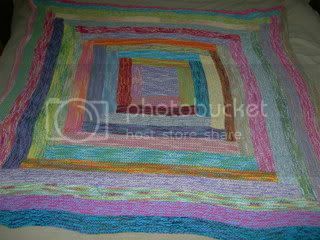 check out more blanket madness at my blog. The baby kimono is finished, and heartbreakingly cute as well. It's in Rowan Handknit Cotton, which has a lovely feel to it (though the guy who rang me out at the vacuum/yarn store down the street commented, "That's a lot of money for blue string"). The buttons were unfortunately washed out in every photo I took, but they are bunnies. I used a ribbon tie on the inside flap. Tomorrow it's off to the baby shower. 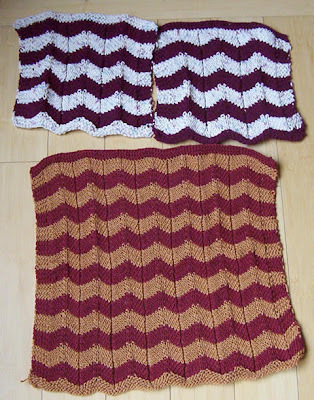 Here's my chevron hand towel with some chevron inspired warsh cloths. I used Elann.com Sonata for the hand towel and stopped at 14 stripes as I ran out of yarn. The warsh cloths are made from standard SnC cotton. Here's my Log Cabin blanket in progress. Thanks to Emily who posted this...it influenced my stripey design choice. A little more info can be found at my blog. I could certainly use an expert opinion before beginning. I am ready to begin the task of knitting a mitered blanket, throw, coverlet...for my queen size bed! I know the popular rage is cotton...but, knitting with cotton KILLS my hands. And wool is so much warmer. Has anyone advice, experience, or thoughts on doing it in wool? I started this way back in the Summer as a way to use all those odds and ends of yarn left over from other projects. I worked on it on and off (mostly off lately) since then. Now all that is left is to fold over the widest edge of the border and sew it down so that it can become a wall hanging. It measures about 31" by 48". It was a fun project, not hard at all. I finally have something to post to the knit-a-long after much too much time away. This is the start of my Bubbly Curtain. I've been longing for one since I got the book, but held off because my window is much (much!) larger than recommended. So. Before I get any further, I could use some advice/suggestions/help. Those of you that made larger curtains, did you work the pattern as given? Or did you repeat part of the lower section? The part with lots of bubbles? I'm wondering if the effect of the bubbles rising will be lost on a 30.5 by 54 inches curtain. I was thinking about working rows 21 through 47 twice and then going on in pattern. Where if you hunt around a bit, you can also find my Perfect Sweater Saga (she wrote, shamelessly trolling). 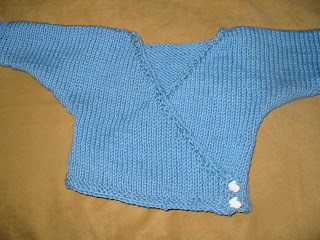 I started the heartbreakingly cute baby kimono yesterday, and am now decreasing on the sleeves. I know newborns are obviously very small, but - 4 inches of cuff makes for a very, very small armhole opening, especially picturing how it will be when the seam's sewn up. So, basically I'm looking for reassurance here, that this will be a good gift. Hello all! Here's a log cabin-inspired project. Made with the log cabin technique from the book, of 2 strands of Cascade 220, and felted. I think it came out so cute! Thanks Mason-Dixon! Knit in Mission Falls cotton. This is my second and I really like the way the texture of the Mission Falls looks in garter sttch. Full details here other information in my blog. 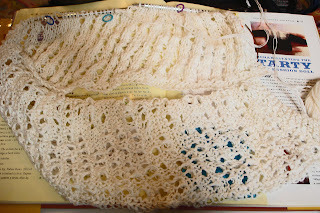 I was playing with mitrers in a different book (Vicki Howell's New Knits on the block). She is showing the them by making baby blocks without a lot of seaming (which I have one done for a friend having a baby in Sept). While I was working on it I realized I could make a fun shape. 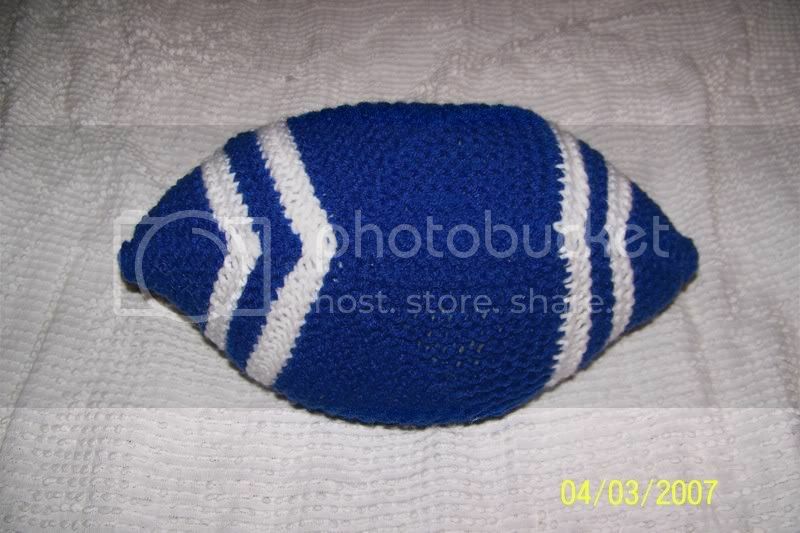 So check out my Colt's Football. Ok -- so I am having a little too much fun playing rather than getting things done. Hope you enjoy the fun idea. Ok, here we go again. I believe this to be my 7th try at this post this morning. Here is my completed blanket! DD loves it. It started out as a multi color Absorba, she saw it told me it would make a wonderful blanket, so there you go. She now has the warmest heaviest blanket ever.....like we need that in So. Cal.! Everyone here is making some truly gorgeous items., keep it up. Edited: here's my new blog. I started Absorba # 2 back in January and have picked it up from time to time but made no real progress. I picked it again up last week and finished it in short order. I knew I was going to need an oversized bathmat. I knit 12 strips around the center square and then added a strip to opposite ends for a total of 14 strips. The finished mesurement is 30" by 38". I have a pink Absorba on the needles, which I'm hoping I can finish just as quickly before it gets too warm to have it in my lap. Visit my blog for details and some thoughts on Peaches & Cream. I'm on a serious stashbusting yarn diet as of late. This project was started to use up my ridiculously large stash of Caron Simply Soft. I used size 8 circulars with logs of 6 ridges wide. I'm pretty happy with how it turned out, and I LOVE what it's done for my stash! This blanket is baby-blanket sized. Using Nona's slant on the log cabin, heres my effort. I am really pleased with the short rows and the wacky lines and diagonals.... it's a pity I have recently finished another afghan or this would have mutated into one cool blanket! A couple more pictures and my final thoughts about the project are on my blog. Order Peaches & Creme Online! Don't know if this is news to everyone, but it was news to me: you can order all the Peaches & Creme online from Elmore-Pisgah! They take credit cards and Paypal. They have cones and balls and 4-packs of balls and a Mason-Dixon Pre-Pack Kit (not sure exactly what that means, but it's an assortment of 12 balls for $15.99). The colors online look pretty good on my monitor (based on comparing them to some colors I have at home), or you can order a complete color card for $12. I ordered a bunch of double worsted for another Absorba, a colorful square one. Thank you, Kay and Ann, for posting this pattern free at your website! It fits perfectly! Made with Fleece Artist Kid Silk (almost two skeins or 450 grams approx).